This page contains a dosage and calculations conversion quiz. As a nursing student you will be tested on conversions. It is important to learn how to solve conversions when you start solving drug dosage and calculation problems. This quiz will test your ability to convert kilograms (kg) to grams (G), milligrams (mg) to micrograms (mcg), teaspoons (tsp) to milliliters (ml), tablespoons (tbsp) to ounces (oz) etc. Before you take the quiz, you can watch a video tutorial on how to solve basic metric conversions using dimensional analysis. Sarah BSN, RN does a great job explaining how to solve these type of math problems. 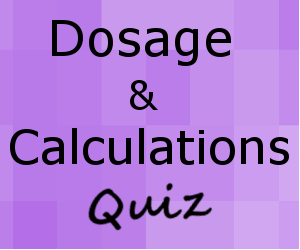 Dosage and calculation quiz for conversions. Convert kilograms (kg) to grams (G), milliliters (ml) to liters (L), teaspoons (tsp) to tablespoons (tbsp), ounces (oz) to milliliters (ml). Quizzes for nursing students and nurses.